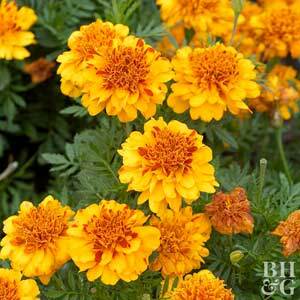 According to Wikipedia, the name Tagetes is from Roman mythology and related to a deity who came up out of the earth when it was being ploughed. Just like these plants that come up each year from last year's seeds. 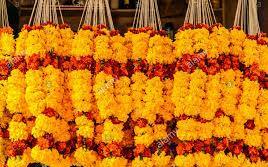 In India and Nepal (where the flowers hold significant meaning), marigolds are typically used to make floral garlands for festivals, weddings, celebrations and religious events. 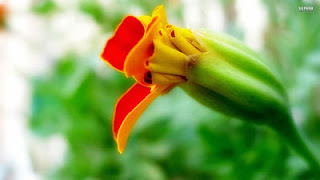 The flowers and garlands are extensively available from markets and street stallholders. 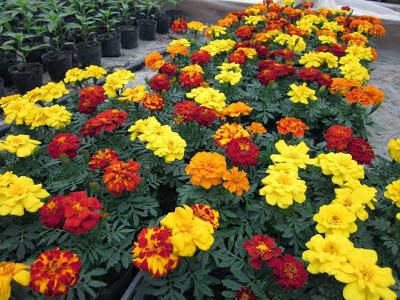 (Pictured left) shows some of the pretty colours Marigolds are available in. Marigolds are common and quite wonderful as companion plants - especially for food crops, as seen here growing happily beside beans, lettuce and corn.